We have used Arizona Tile as a slab and tile supplier for two years. They carry an excellent product line and have provided impeccable service to all of our clients. To visit their website click here. Block Tops is the fabricator that we use for our designs that include natural stone. They also carry a very wide selection of Solid Surface and Quartz products. To visit their website click here. 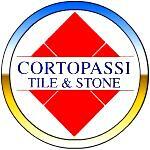 Cortopassi is a Tile supplier that we used for the first time this year. Their selection of Tile is very impressive. To visit their website click here. Portland Willamette has been our resource for custom fireplace doors since we started. To visit their website click here.